The recent rocket launch successes claimed by Iran and North Korea signal significant advances in the two nations’ missile programs, but they do not suggest that either country is yet capable of mounting a serious attack on the United States, experts say. North Korea lofted a satellite into Earth orbit in December, while Iran said last week that it had sent a monkey to suborbital space and recovered the animal unharmed (a claim that Western intelligence officials have yet to verify). The widely condemned launches show that North Korea and Iran are making strides in their pursuit of long-range missile technology, but the liftoffs aren't cause for panic in the United States or the wider world at this point, experts say. Both countries have issued statements claming that their launches were meant primarily to advance the capabilities of their space programs, not to develop intercontinental ballistic missiles. But the two ambitions are tightly intertwined since ICBMs reach suborbital space on their way to a distant target on Earth's surface. "Any space-launch vehicle capable of placing an object in orbit is directly relevant to the development of long-range ballistic missiles, as well as SLV technologies, and they're all virtually identical and interchangeable," U.S. State Department spokeswoman Victoria Nuland said during a press briefing in Washington on Jan. 28. The stakes are high with both nations, as North Korea possesses nuclear weapons and Iran is thought to be pursuing them. The United Nations recently imposed additional sanctions on the already-isolated North Korea in response to the country's December launch, and Nuland said Iran's monkey mission also represents a violation of international rules, if it actually took place. Iranian space officials announced Monday (Jan. 28, 2013) that they have successfully launched a live monkey into space. "UN Security Council Resolution 1929 prohibits Iran from undertaking any activity related to ballistic missiles capable of delivering nuclear weapons, including launches using ballistic missile technology," she said. Part of the concern stems from the two nations' widely expressed antipathy for the United States and its allies. The cleric-ruled Islamic Republic has repeatedly called the United States "The Great Satan," and North Korean officials reacted to the new sanctions by declaring the United States an enemy. The rogue nation also vowed to ramp up its rocket program and conduct its third-ever nuclear test. "We are not disguising the fact that the various satellites and long-range rockets that we will fire and the high-level nuclear test we will carry out are targeted at the United States," North Korean officials said last week, according to ABC News. North Korean rocket technology traces its origin to Soviet Scud missiles, which apparently entered the country in the 1970s, via Egypt. The Taepodong-1 has flown once, launching in August 1998 in a failed attempt to deliver a satellite to orbit. 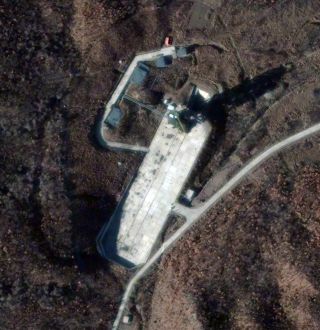 North Korean researchers then came up with the Taepodong-2, which suffered its own launch failure in July 2006. Estimates of this rocket's maximum range vary from 3,000 to 5,400 miles (5,000 to 9,000 kilometers), meaning it might be able to reach the West Coast of the United States. Some analysts say the Unha-3 launch shows that North Korea possesses the technology to reach a target at least 6,200 miles (10,000 km) away, potentially bringing parts of the United States into range. But that doesn't mean North Korea has mastered long-range weapon delivery yet, Johnson-Freese stressed. "How far a rocket can travel and how far it can accurately travel according to the payload weight on board are very different issues," she told SPACE.com. "So do I think that putting a satellite in orbit really demonstrated that they can hit Hawaii accurately with a nuclear weapon on board? No. Does it take them a step closer in capabilities? Yes. But these are exponential steps. They're not easy steps." At the moment, Russia and China appear to be the only two nations that could mount such a major missile attack on the United States, she added. Iran, for its part, has also apparently built its rocket and missile program up from a Scud foundation, with some help from North Korean technology along the way. The Islamic Republic has successfully launched several satellites into orbit, including the small, Earth-observing "Promise of Science and Industry" craft last February. Michael Elleman, a missile-defense expert at the International Institute for Strategic Studies and a former UN weapons inspector, has estimated that Iran wouldn't be able to strike the United States until 2020 at the earliest, though countries closer to the Islamic Republic obviously face a more immediate threat. The United States aims to be ready if a nation like North Korea ever decides to send ICBMs across the Pacific. The American military has been seriously developing missile-defense technology for three decades and has made substantial progress during that time, Pentagon officials say. U.S. warships equipped with a system called Aegis, for example, can detect, track and in some cases shoot down enemy missiles in flight. Ground-based facilities in Alaska and California also have the potential to intercept incoming missiles from a rogue state, though the success of the system in the face of a complex attack that employs multiple decoy targets is far from guaranteed, experts say. Long-range missile defense "is a very difficult technology to master," Johnson-Freese said. "It's harder to play defense than offense."